Transport Secretary Chris Grayling has been accused by MPs of evading scrutiny over his department's £33m Brexit payout to Eurotunnel, after another minister took his place in the Commons. Health Secretary Matt Hancock responded to questions about Friday's settlement. He defended his appearance, saying the out-of-court payment had secured the "unhindered" supply of medicines if there was no Brexit deal this month. 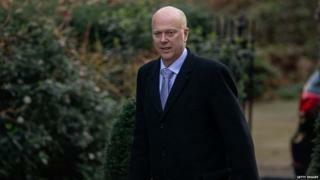 But Labour said Mr Grayling had become an "international embarrassment". Its transport spokesman, Andy McDonald, said the cabinet minister had shown his "disregard for taxpayers" by his absence and must be sacked immediately. "Once again the transport secretary is not in his place to answer a question directed at him," he said. "Even in this golden age of ministerial incompetence, the transport secretary stands out from the crowd. "He leaves a trail of destruction in his wake, causing chaos and wasting billions of pounds yet he shows no contrition, no acknowledgement of his mistakes nor any resolve to learn and improve. "The transport secretary has become an international embarrassment." Asked where Mr Grayling was, Mr Hancock said he was busy seeking to improve the UK's transport network. The health secretary challenged the opposition to say they would not have sanctioned the settlement if they had known, without it, vital medicines might not be available. Mr Grayling has been under political pressure for a series of transport policy mishaps, leading his opponents to dub him "failing Grayling". In December, the Department for Transport contracted three suppliers to provide additional freight capacity on ferries for lorries but Eurotunnel said the contracts had been handed out in a "secretive" way. One of the companies awarded a ferry contract, Seaborne Freight, has already had its deal cancelled after the Irish company backing it pulled out. This followed BBC news finding out that Seaborne had no ships and had never run a ferry service.